Science depends heavily on mathematics and in particular on continuous mathematics. Scientific laws are often in the form of differential equations, which may not have a solution in closed form. Furthermore, such mathematics makes the assumption that space is infinitely divisible and that a coordinatising it via real numbers with infinitely many digits makes physical sense. Many people have therefore wondered whether it it possible to use discrete mathematics instead. In this book Stephen Wolfram demonstrates a possible way of doing this. The book is based on cellular automata - that is arrays of boxes where the contents of each box changes according to some rule based on the box's neighbours. The book looks at cellular automata in one, two and more dimensions, as well as similar discrete systems which change over time according to simple rule. Their behaviour is illustrated with plenty of pictures, which helps in the aim of linking the behaviour of the real world to the behaviour of such simple systems. For instance, the pigmentation patterns of many animals bear a striking resemblance to patterns obtained through the evolution of cellular automata. On a smaller scale, Wolfram examines how the fundamental behaviour of space-time can be modelled with such discrete systems, showing the wide applicability of such ideas. 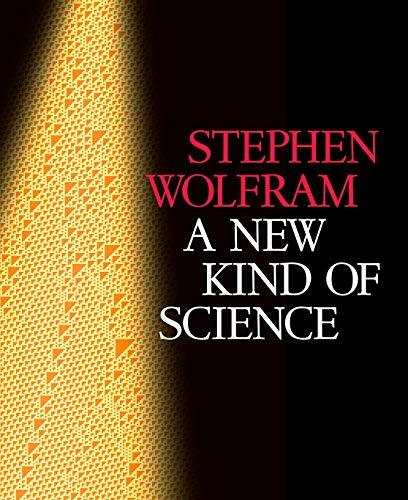 Wolfram doesn't limit himself to rewriting science in a discrete form. He also aims to demonstrate what he calls 'The principle of computational equivalence'. This claims that many systems - both physical and theoretical - are universal, in the sense that they can be used to perform arbitrary computations. One new way of thinking that he brings to us is that of using a brute-force computational approach to investigate the space of possible behaviours of a system, rather than looking for simple cases which can be examined with pencil and paper. For instance to investigate the theorems which can be proved from a set of axioms, he sets a computer to generate each of them in turn. If half of the possible statements turn out to be theorems then it indicates that the axiom system is likely to be complete (although short gtheorems might have long proofs). Likewise with computers - he looks at the behaviour of Turing machines one by one to see what they compute. Wolfram has been able to fund himself from his sales of Mathematica and so the book is excellent value - with 850 pages and 350 densely packed pages of notes. He wrote it to communicate his ideas to you, rather than to make money from book sales. In fact the book can be read for free online if you wish. However, to follow the examples in the book requires either access to Mathematica or the purchase of NKS Explorer. Considering this, Wolfram doesn't seem so altruistic - I would have hoped for the ability to try out some of the ideas for free on the website. Wolfram's independence also means that he was able to produce the book he (rather than a publisher) wanted. This brings a lot of benefits, but it does highlight Wolfram's arrogance. Now to a large extent such arrogance is necessary if you have a new idea to communicate to the world. To become unsatisfied with academia, become a billionaire from a software business, then devote ten years of you life to rewriting science - it's the sort of thin I might have done if I wasn't so lazy. However, there are problems with such lack of restraint, and in particular I felt that the first chapter made inflated promises about what can be achieved - the book should have plunged straight into the ideas. In fact the theory is very much in its infancy - you couldn't apply what is in this book directly to a particular scientific problem. The real fault with the book is that there are no references to other works. Looking on the website I came across a bibliography which I thought might rectify the omission, but no - it a is a list of books referring to this one. I can see that in a work of this size adding references would be a vast undertaking in itself, but I think that it is something Wolfram should have done if he is as serious about the project as he claims. The lack of references makes it hard to use the book to follow up on a particular area of interest. If his main aim was evangelise about his new way of thinking, then my feeling is that a much shorter book with colour illustrations would have done the job a lot better. On the other hand I am convinced that mathematics used in science will move away from the paradigm of continuity, and in 'A New Kind of Science' Wolfram offers one possible path. Even if you have no intention to become fully immersed in the use of cellular automata and discrete mathematics (which seems to be what Wolfram expects of you), I would say that it is definitely worth keeping track of how his project is progressing.